Extensive and long-term research in dialog with a variety of ethnic communities in the Negev desert, showing that the desert is a patchwork rug, a common fabric made up of a variety of threads. The “Unrecognized” project was born in 2003 following reports of Bedouin fields in the Negev which had been sprayed with a toxic substance from the air, in a State-sponsored act. I started to look into the matter and came face to face with the issue of the unrecognized villages and their inhabitants. As an artist and an initiator of projects for social change, with awareness of the importance of public opinion in political processes, I assembled a project that makes use of artistic, media, educational and social tools to bring the story of the unrecognized Bedouin villages to the attention of wider audiences in Israeli society and abroad. With the help of the ‘Regional Council for the Unrecognized Villages in the Negev’, and with the aid of personal ties forged in the course of the work, I appealed to individuals, to official representatives and to groups from the unrecognized villages to participate in a project that would portray each village through a story and a photograph. The decision on the story to be told and the photograph to accompany it was made jointly in a process that took over two years, and that included meetings, interviews and joint discussions. The panoramic photograph format adopted in the project is the generally accepted format for landscape and group photographs. In the annals of photography, most photographs of panoramic views portray powerful images of nature and of wild landscapes; people are, for the most part, absent from such photographs. If they appear at all, they are presented romantically, as miniature figures, as part of the landscape. 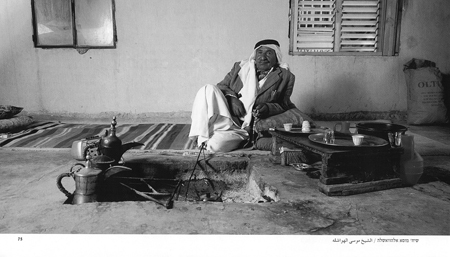 The panoramic photographs in the “Unrecognized” project can therefore also be seen to run counter to the way the country’s leadership has viewed the Negev and its Bedouin inhabitants at different times. The romantic perception of a flock of sheep and a shepherd playing a halil (flute) on the horizon, alongside ideals that refashioned the Negev in line with imported Western standards, are confronted in the project by images of a contemporary and rich reality. Sharp and clear images whose objects are generally placed at the front of the photograph, stare directly into the eyes of the spectator, while the stories beside them explain the photographs’ social, political and humanitarian context. The main focus of Tal’s work is on the dynamic relations between political narratives and intimate personal stories. His artistic work is inspired by the current political, economical and social structures of daily life. He uses a range of artistic languages from guerilla communication with fake political campaigns in the Israeli public space (Pettek, 2002, where he was a candidate to the Knesset) to scientifically based projects like the research of the different ethnic groups living on the territory of the Negev desert, with a great variety from Bedouins, Palestinians, Israeli, etc., and social work involving the creation of non-governmental organizations as an art project, which however develop actual useful activities (Unrecognized, 2008-now, work in progress). Der Hauptfokus von Tals Arbeit liegt auf den dynamischen Beziehungen zwischen politischen Narrativen und intimen persönlichen Geschichten und wird durch die aktuellen ökonomischen und sozialen Strukturen des Alltagslebens inspiriert. Er benutzt eine Vielzahl künstlerischer Sprachen von der Guerilla-Kommunikation mit gefälschten Wahlplakaten im israelischen öffentlichen Raum (Pettek, 2002, wo er für die Knesset-Wahl kandidierte) über wissenschaftliche Projekte wie einer Forschungsarbeit über die verschiedenen ethnischen Gruppen, die im Territorium der Wüste Negev leben (Beduinen, Palästinenser, Israeli, usw.) bis hin zur Gründung einer Nichtregierungsorganisation als Kunstprojekt, die tatsächlich gemeinnnützig tätig ist (Unrecognized, seit 2008, work in progress).